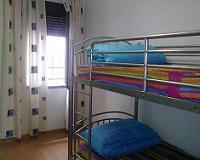 Built in 2011, our hostel Los Pascuales has three floors. The ground floor is fitted for coexistence. It has two living rooms for resting or talking or also playing the classic board games. In both living rooms, you will find coffee machines, soft drinks, snacks and a microwave. Coming from the living room, you will find a big courtyard with some tables and also a ping pong table for the competitive ones! In the floors 1st and 2nd we can find all the rooms, fitted with air conditioning or heating. Each floor has an area of common bathrooms with two showers, two toilets and two sinks. Each guest will have a locker with an individual key. 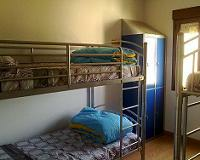 We also have a room in which you can leave your luggage if it is necessary, with the supervision of our staff. 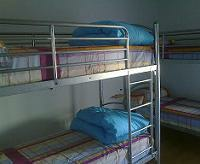 The capacity of the hostel is of 23 beds, distributed in rooms of 2, 3, 4 and 6 people, mixed or unisex. Our wi-fi internet conexion is in all our building. It is not necessary to rent the whole room, you will only pay for the bed you will have. Linen and towels are also included in the price. We have our own laundry service for our guests. Please check our fares. You can access to our hostel “Los Pascuales” from a semi pedestrian street of the Templar neighborhood where you will not have to worry about city noises. 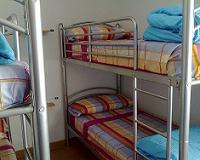 In our hostel Los Pascuales you will find all the necessary to make your stay unforgettable and pleasant. Also we will resolve and help you in any question or doubt you may have. Come and visit us, if you are coming to visit Toledo or if you are going to visit Madrid!! Remember that you have very near the train station and you can visit Madrid in our fastest train AVE, just 50 minutes away! !